I'm connected to the world again. Phone lines back up so taking time to update the website in case it drops again. Almost been in Sudan a month now. Time's flown by and I've enjoyed every minute. Looking back I would have shipped a few different things. Thrown some junk away that I really didn't need and shipped everything later than I did. It only took about 5 weeks for it to arrive starting from the day it left my place to the time it arrived in Khartoum. Something I'm glad I shipped were DVDs and VHS tapes. The one English speaking channel gets a little boring sometimes so I'll throw in a movie of my choosing. Rearranged the house furniture so it's more livable. Up till now it looked like something arranged for a open house. Here's a shot of some of the local artisan crafts I've picked up since being here. 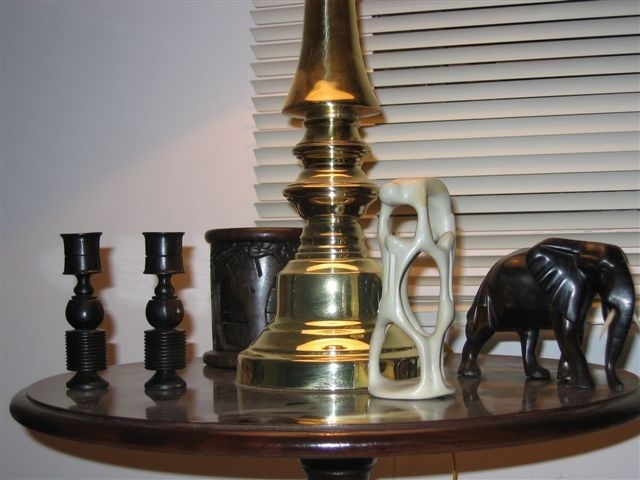 Off to the left are some ebon wood candle holders, in the back is a carved coaster holder with coasters, to the right is a wooden elephant, and in the center is a soapstone carving of 4 figures symbolizing "unity". Several of the shops I visited had similar items for sale, there were a lot of things with ivory. I was surprised to see it sold easily like that. Several places had homemade daggers and swords that looked very nice. The weathers been hot and a bit humid. We had a haboob come through Friday night that left behind a mess of muddy roads and yards. Never realized the water doesn't have anywhere to go so it just pools up. Workers tend to go out the next day to help drain the muddiest of places and redirect water to large and deep gutters that line the roads. The gutters appear to look like half finished construction projects until you see them everywhere and realize they're for all the rain. Most of them are about 5 feet across 5-6 feet deep. Driveways have little bridges that run across them. Oh, some other observations. Hooded golf carts run all around the city. Most of the people call them tuc-tucs. Probably due to the sound they make as the buzz by you. "Tuc-tuc-tuc-tuc" The driver sit up front in the center and a couple people can sit on the bench seat in the back. Several of vehicles are decked out in all kinds of accessories and decorations. I'll try and get some photos of them. Yeah, still trying to get my permit submitted. I'm short a few passport photos of me so rounding them up is a pain. Ok, done for a few days. Ever wonder what it would be like to stand around on a hot tarmac in a foreign countries airport in 105 degree heat. Well it an't no trip to Cleveland. I got to experience it first hand this week and all I wanna say is I'm glad I took plenty of water. Having supper at home tonight since I have a lot of my food now. Nice to be able to cook again after being without all my dishes since the end of June. Still working with the transport companies to see if they can track down the last box of consumables that didn't arrive. Fortunately, I received all of my possessions Monday that I had shipped back in June. Out of 325kgs only one coffee cup broke. Now I'm wondering why the hell I shipped so many long sleeve shirts here. I've decided I'm leaving almost all my clothes here and buying new the next time I move. All my food that I did receive was great. I bought a lot of Oreos, Pringles, peanut butter, tuna, SPAM, coffee, crackers, and cake mixes. Yeah, SPAM. Say what you want but you can put it with anything you want. I've starting to crave some stuff I never thought of or couldn't bring like brownie mix, butterfingers, ice cream, krispy krème donuts, and tostito lime chips. Starting to make a list so maybe family back home will have something to send in a care package. Hint hint. Started growing my head and beard since it's easier to maintain out here in the 'toum. It's adequate but I like the clean shaven look better. Some of the locals have said it looks better this way. I think I was too freaky looking for the custom here with a shaved head. Some local observations. While driving around I noticed one part of downtown is specifically used by young men for auto repair. You'll be driving down some side streets and then bam. You're surrounded by guys with every model and year of car known in these parts, up on jacks, with hoods up. Some younger guys walk around with tons of steering wheel covers, wiper blades, and assorted accessories. I think they are just walking auto stores that try and sell stuff to the other guys. This goes on for several blocks and everyone seems to be busy with one project or another. So odd since most of the repairs I see state-side involve big garages where all you see are the cars and no one working except in car bays with racks and racks of parts and equipment. Found out through the grapevine there are events going on that I'm late in checking out. I heard there was a car show at the free market. That's a large venue with plenty of outdoor space. Think of a fairgrounds and you'll get the idea. Another event was a circus. It's been going on for a few nights and the report I got from another foreigner sounds very interesting. Gonna try and catch that as soon as I get a chance. Also found out Sudan is home to the Whirling Dervishes. And you thought you never learned anything on the internet. Spent the other night at a German Sudanese club and had a nice time mingling with folks from work and other expats. Plenty of good food and music. Ethiopian dancers provided dancing. Several women and a couple guys performed versions of their native dance. I swear I saw them doing the running man during one part. They spent at least an hour on stage. Still trying to put away all my clothes. Had to bail out of another evening out just so I could spend a couple hours sorting through all my stuff. Normally, I'd take a day off but with so many things going on I figured I do it during the evenings and just let it slide. Probably not necessary but I'd rather keep up to date on work and projects I'm working on. Gotta wrap it up for now. Never realized how much I depend on a phone line until I was without it for three days. After talking to the local phone company I got it back. Got IM up and running to chat with friends and family. Still waiting for my personal items to clear customs. Hopefully I'll get them in the next week. Kinda tired of wearing the same two pairs of shoes. Guess I could wear one of each. Work has been busy so haven't had a lot of time to do anything. Just got the rest of my stuff unpacked after two weeks now. Still working on my photo permit so unfortunately there's a lack of local stuff on the site. My phone line went down again Friday. I get insane static noise when I try and dial. Checked the line outside my house all the way to the demarc. It has a good connection with my pair so I just retaped all the exposed splices and will have to contact the local phone company again. Hope that isn't the future for me for the next year. Only thing I really wanted was a halfway stable line and I'm only getting about 2 days a week out of it. At least I got to hang out with all the geckos hiding amongst the phone lines and conduit tonight. The yard cats were on the prowl looking for frogs and Tank was trying to cool off near his hole. Everyone looks like they called it a night and I'm probably the only one up right now. It's around midnight and I just finished testing the phone line. Saw "50 first dates" tonight at the embassy recreation center. It was just reopened last week and it was the first time I had been out there. It's not bad but the pool is still empty due to a leak or crack someone said. Some of the embassy staff are leaving in the next few weeks so they had to ask for volunteers to help organize the rec center and future events. I was asked to be VP and Abdul was asked to be Prez. He's pretty busy with his department and so am I but together I hope we can bring in some a little more organization to the committee. Unfortunately, I believe there's a lot of paperwork that needs to be done that everyone blew off so Abdul and I are going to have a lot of work to do. Spent the day sweeping out the upstairs patio balcony and then headed into work to get my phone tools. Had a driver pick me up and on the way noticed he had a tape in the car stereo. It was pretty good so I asked what kind of music it was. Of course he said Sudanese. Still trying to remember the artist name. Among the different ways to get to work, one road passes by the White Nile river. It's high this time of year and is almost at it's crest. Some people say its gone up about 10 feet since they've been here. The rec center is along it and I noticed the water really looks like chalk when you see it at night under the right lights. Most of the time it just looks kinda grayish green. I saw where the Blue night meets with it and you can really see the line where the two rivers meet. Was able to fix a phone problem with trunk lines so that was a nice plus. Met up with Joe after he got in and checked email. I fired off a few since mines down at home. He needed to stop at Afra for groceries so I went along and spent $56 on a ton of noodles, water, soda, juice, chicken and fish, and misc. I noticed another section of the store that carries electronics, clothes, video and music. Didn't' spend a lot of time there, but will have to go back and check it out. If I can't find any other local music I'll have that as a fall back. Time to sleep, more later. Today was actually a day off for the locals in Khartoum. I spent it working and getting a few things done. I finally had a chance to take some pictures last night. That's a picture of Tank. 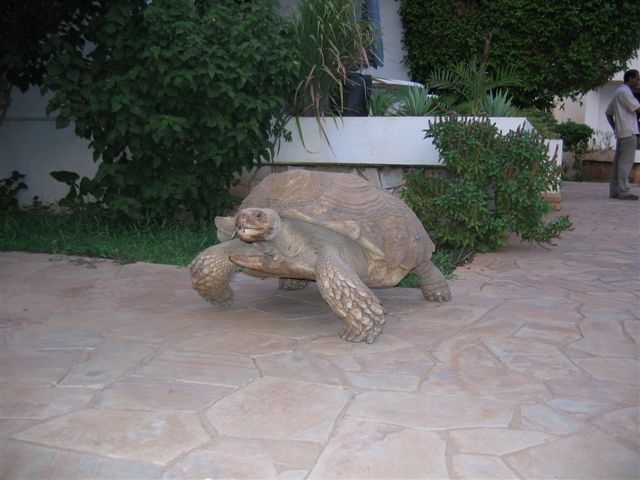 He's a 100+ year old tortoise that's the townhouse groundskeeper. Someone always got some left overs for the fella. This is one of the rare moments when he's on the move. I met his girlfriend the night before at another residence. She's about 1/2 the size of Tank. Hence the reason why she's at another place. Tank has a tendancy to make a move on anything vaguely resembling a armor plated female. There's several cats that have taken up residence in the backyard. They say they keep the snakes away, but I understand they like the little gecko's too. Which is a shame since those guys keep the bug population down. Friday night, I spent the evening hanging out with Lloyd , a fellow coworker. We had a nice Turkish dinner near the new mall in town. I had a turkish meat special consisting of rice, fries, sauted meat and veggies over a open brazier. Lloyd got us some turkish bread which was soft and tasty. It's actually a 2ft long loaf they cook and ends up with a bunch of air pockets. Think of a huge pita pocket and you get the idea. After dinner and the check, they offer you what I thought was a spritzer of water to rub into you hands. I didn't realize it was cologne until we were walking out and the aroma followed us. The restaurant is close to the Afra mall, so we went there to do a little grocery shopping. The grocery store in the mall has a great selection of everything you basically need. I bought some local brands of cookies, coffee, bread, and marmalade. Fanta's big here. I bought a couple liters for my soda addiction. On the way home we stopped at Tuity Fruity. We both bought a pan of ice cream that costs about 1400 Sudanese Dinars. that's 5-6 bucks US. It tastes like a shorbet only better. I got the Limone flavor. I'm salivating just thinking about it. We stopped one last time near Lloyd's place to buy some fresh loaves of bread at a little baker stand. The baker/cashier was kind to us as we tried to figure out how much bread we get for 200 dinars. Turns out we were giving him enough for about a dozen loaves when we were only buying a couple each. He gave us most of it back and I rewarded his honesty with giving the coins to a nearby boy. Our driver, Micheal, was nicely waiting all night during all this driving around. After Lloyd was dropped off, I was dropped at my place and I got a chance to unwind at home. All week I've been going to parties and dinners. Most of them have been for people that have finished their tours and are going back home or on to their next tour. I still have several things left to do at home that I haven't had time to do since arriving. The rest of my possessions should be arriving next week after customs clearing. It'll be nice to unpack them since I haven't had them for 7-8 weeks. I still have to fill out the paper work on a photography permit so I haven't had a chance to use my camera as freely as I want yet. Hopefully, I'll have that cleared up soon. That's all for now. So I'm sitting on a 777, awaiting the take-off from Dulles. It's Friday night, Aug 6th, the day was beautiful with temps in the 70's and a cool breeze blowing. I found myself wandering around Arlington trying to find a Laundromat to do the weeks worth of clothes I had accumulated since waiting for my Visa for Sudan to come through. After all this waiting the realization finally hit home like I knew it would. I'm getting on a plane and going to spend a year away from the US. So many things to do and prepare for causes you to forget about that. Well its here now and good or bad I know it will be an adventure. Some of the things I'm going to miss most are; my family, movies, TV, Krispy Kreme chocolate covered crème filled donuts, my Jeep I sold before flying out here that took me coast to coast, Broadband Internet, DC with all its craziness, all the stuff I put in storage that I'll hopefully see again someday and laugh at why I decided to save some of it.